Stacy Blackman Consulting’s Interview Guide is a comprehensive resource to help you prepare for your interview. 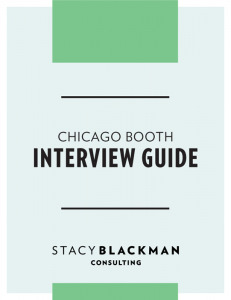 The guide discusses the qualities that Chicago Booth is seeking in successful applicants, outlines the format and style of a typical interview and provides typical questions accompanied by sample answers and analysis. The guide also provides interview preparation exercises, as well as real interview transcripts and an appendix with over 150 sample interview questions.